We are the leading dealers in the batteries for vehicles as well as for general purposes. If you are having trouble with your U.P.S then just have a call to us and we have all our technicians who are very skilled and experienced in their field to solve your problem skillfully. We have now commercialized ourselves through Udaipurmart so that we are online. So you can just have a glance at our services and then give us a chance to solve and meet your challenging demands. We deal in the best brands and companies and our products last long with the credibility. 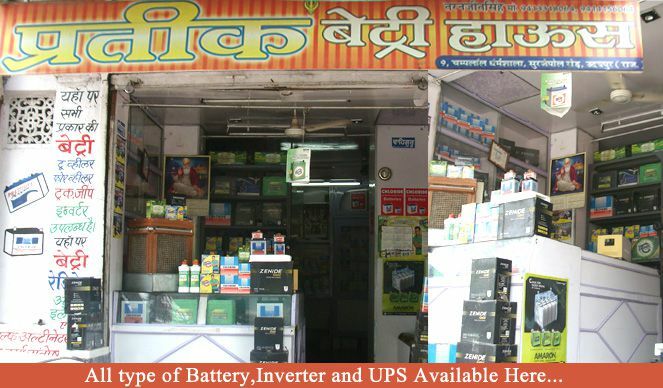 We have the inverters and U.P.S from the brands like MICROTEK,LUMINOUS,SF SONIC, etc. Moreover if your old batteries are about to die and asks for replacement then we have the best brand’s batteries available for you, like EXIDE,AMARON, SF SONIC, etc. If your 2 wheeler and 4 wheeler demands for the replacement of the batteries then we have the best dealership of batteries in the market so far. Moreover we have various offers and discounts availed at nominal rates.